International sentencing has become significant given the numerous events on the world stage which have focused attention on the justifications and adequacy of punishment for heinous crimes such as genocide and crimes against humanity. In addition to providing a detailed evaluation of the philosophical and theoretical difficulties raised by this rapidly developing area of international criminal justice, this book provides an integrated socio-legal analysis of the law and process of international sentencing. It considers the rationale and development of international sentencing structures and processes, the nature and scope of legal and procedural constraints on decision-making, as well as access to justice and rights issues. The book discusses sentencing within the context of international criminal law and examines internationalized trial processes and alternative mechanisms for resolution. In seeking to comprehend the punishment of international crimes through the comparative contextual analysis of trial processes, it challenges our present understanding of how and why particular sentencing outcomes are produced and the perceived legitimacy of international trial justice. 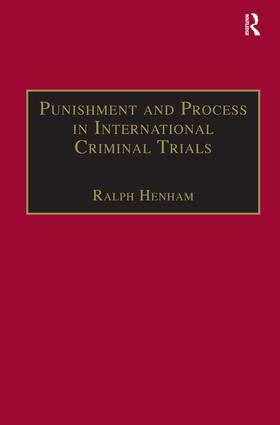 Contents: Introduction; Internationalisation and sentencing; Procedural rules and trial practice; Sentencing as social reality; Normative constraints on sentencing; Philosophical issues in international sentencing; Access to justice and rights; Theoretical and methodological issues for international sentencing; Conclusion: reconceptualising international penality; Bibliography; Index. Ralph Jean Henham is Professor of Criminal Justice at the Centre for Legal Research, Nottingham Law School, Nottingham Trent University, UK.